Steve Jobs is one of those people who is constantly quoted and venerated. I could have shared a picture of a Mac, or a iPod, or some other invention of Apple's, but instead I felt it was important to show that love for word can come in all shapes and sizes. This is a picture from the Hemi Hideout, a unique type of convention center. It's Timber-frame 21.7 thousand square feet structure houses 24 of the most iconic American Muscle Cars. This structure and its contents are a tribute to the love of cars by John Hovas, and is truly a sight to see. 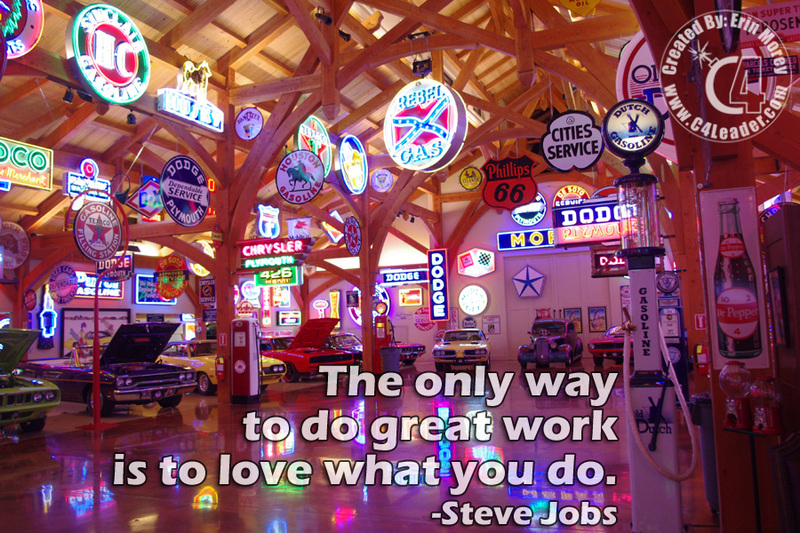 Are you doing what you love, or are you performing a job? What great deeds do you hope to accomplish? I wish you the best of luck in finding what it is for you!